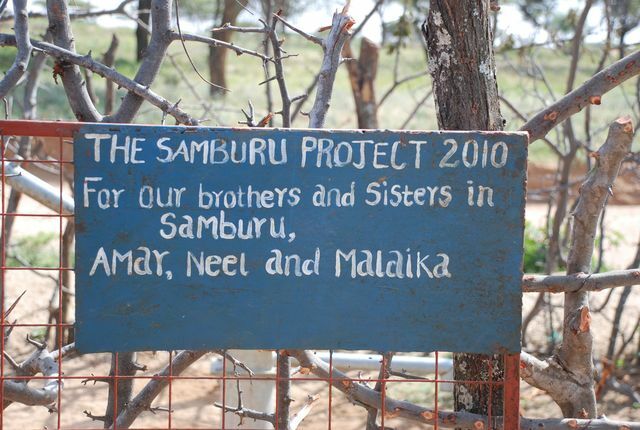 Funded by the Ramachandran Family, The Samburu Project drilled and installed a shallow well equipped with a handpump in this community. Women and children formerly would walk from 5 - 7km to fetch water. The well shortens that distance drastically to a mere 5-minute walk. The livestock are able to keep hydrate because of the well water. 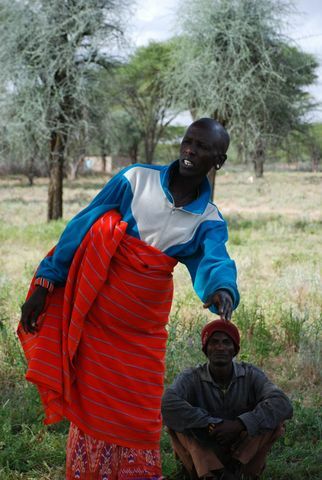 As a pastoralist community, the well has helped the community survive drought. It has created a lifestyle change. 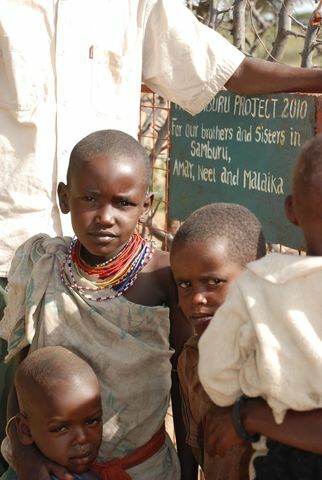 Because they spend less time getting water, children, especially girls, have time to go to school. Women have time for family, going to town to sell their beads, and to prepare their meals on time. They normally carried 20-lb buckets on their heads that used to give them headaches and backaches. It was also unsafe as they carried their children. Women no longer have to walk in the mountains, a life-threatening feat due to the prevalence of dangerous wildlife including leopards, elephants, and buffalos. They are planning on creating a farm next to the well . They are waiting for the rains to come and then plan on supplementing with water from the well. Even when we were still a few meters away from the well, Lucas could tell that there was something wrong with the well. He pointed out to me that the girls should not have to use that much force to pump the water out. Normally after two small pumps, water should be coming out easily and abundantly. At a closer look I realized that the children had to jump up and down in order to get the handle to go all the way down and very little water was coming up with each pump. When we got to the well we realized that the piece connecting the hand pump to the well was missing; in its place, the community had placed a few sticks to hold the part together. Lerooto, the chair of the well committee, said this problem started about a month ago. Lucas has never seen this type of breakage to any of the wells before and therefore does not have the spare part on hand; when he takes me back to Nairobi at the end of my trip he will buy the spare. In order to pay for the part, the community already has a fund for repairs. This particular well committee is well structured and they have a treasurer that is in charge of maintaining the fund. Once they find out how much this particular spare part costs they will have each household contribute more money to make up the difference. One thing that Lucas pointed about this well was that the slab foundation is particularly low. It has not been an issue for this community but for the future wells, the slabs should be higher. In terms of the well's impact on the people, having clean, safe drinking water nearby has radically changed the lives of everyone in the community. Before the well, women would have to walk six hours a day and travel behind a mountain where there was a small river. This river and other hand dug wells nearby were contaminated by wild animals. As a result, many people would get diarrhea and other water-born diseases from drinking this water. 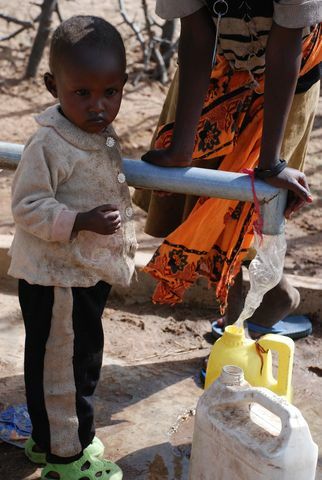 Now that they have the well, it only takes a matter of minutes for women to get safe, clean drinking water. Waterborne diseases have greatly decreased. Women can now tend to other duties and do their jobs easily: cooking, looking after livestock, getting firewood, washing their clothes. The water from the well is primarily used for drinking and cooking and also for washing. Now that they have water, many households have small gardens near their homes. It is the responsibility of the Well Management Committee to protect the well and oversee the children's usage. The community is able to water their livestock from the well. 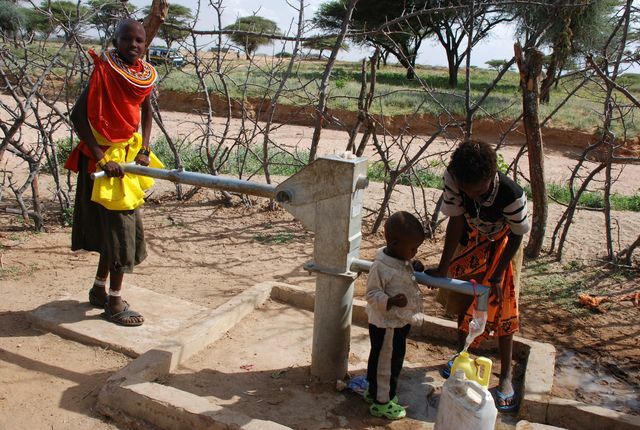 The well has helped the community survive drought. Because they spend less time getting water, children, especially girls, have time to go to school. The women of the community do not have to walk as far to find water; consequently they have more time for family, going to town to sell their beads, and are also able to prepare their meals on time. They used to carry a 20-lb bucket on their head that gave them headaches and backaches but now they no longer have to do so. Community safety has improved as mothers no longer have to carry their children on the journey to fetch water. Women no longer have to walk in the mountains, a life-threatening feat due to the prevalence of dangerous wildlife including leopards, elephants, and buffalos.